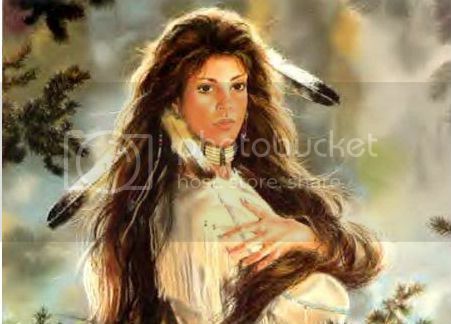 Native Americans can face difficulties when tracing their family lineage. Some records are lost or were never made. Families and whole tribes have been displaced from ancestral homes. The ancestors of others chose to leave their communities. Many native groups had the cultural practice of changing individual names at different times in life, and some native languages have been lost. Inspired by a true story. Fleeing with her two children from an abusive ex-husband, a woman must make the difficult choice to disappear or kill him. Katherine KotawShared publicly – 4:13 PMI’m beyond thrilled to announce that my memoir, "Quicksand: One Woman’s Escape From The Husband Who Stalked Her," hailed ‘Book of the Year’ by The Globe and Mail, has inspired the original film, "Run For Your Life." "Run For Your Life," starring Amy Smart (The Butterfly Effect, Shameless) will premiere this Saturday, October 4, at 8pm ET/PT on Lifetime. The ‪*NO MORE‬ PSA* Campaign, spearheaded by the Joyful Heart Foundation in collaboration with NOMORE.org and directed by actress and advocate, Mariska Hargitay (Law and Order: Special Victims Unit,) partnered with Lifetime in order to premiere "Run For Your Life" in support of National Domestic Violence Awareness Month. A wonderful shop to purchase your handmade gifts. This week I would like to introduce you to a “pair of lovely Brooklyn, NY natives” whose handmade knitting and crochet items are a hit from coast to coast. Calcedonia Design. Dora, as we know her, has sold her handmade items from local community fairs, church fairs and to the local boutiques in the Brooklyn, NY area. She has worked in the crafting business off and on for many years and like most of us, just got “hooked” on crafting. Dora, also named from her mother’s nickname (Dora), is joined by her mother, Calcedonia, (To which the Business Name comes from both these ladies) as business partners and make a great team. These two amazing ladies make & hand design fabulous baby accessories, scarves, hats and you can purchase other items in their store, such as jewelry and doll clothes. Mother Calcedonia, is 90 years young and we hear she can knit and crochet up a storm. God Bless You! I suppose that could be the cause of the windy weather that comes from the Brooklyn area at certain times of the year. (smiles) This pair of unique ladies are the heart and soul of the Calcedonia Design Store. Even before the dream of Calcedonia Design was formed, Dora and Mom were very active in many charities to help the less fortunate and the children in the local NY area. Many of their handmade products went to the charity of “Babies in Need”. A non-profit organization in Long Island, NY, where both ladies donate blankets, preemie hats and booties, all hand made. Their other favorite charity is The Salt and Sea Mission; it’s also an organization for Children in need at Christmas. So you can see, these ladies are very busy year round and do a bang up job of spreading color and warmth to others. Nothing is “scrapped”, they make use of every inch of yarn with their wonderful talents. In 2008 Calcedonia Design joined the Etsy online community and has been a hit seller ever since. 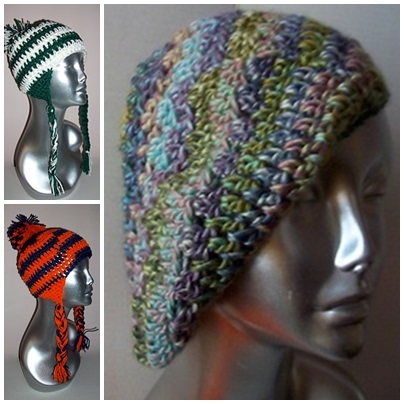 You can choose to Special Order or purchase from ready to wear hats, scarves, gloves, tams and even special order your favorite Team Sports colors. 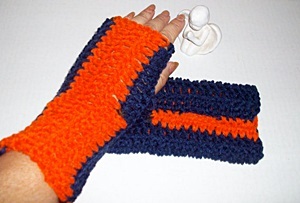 Baseball, Football or just about any sport that shows their team spirit colors, Dora and Mom can make for you. Just remember, “Special Orders” do require time and you should always email Dora for any special information or approximate date to expect your order. Calcedonia Design is more than just an online store. You can find many other items for your buying pleasure and gifts. 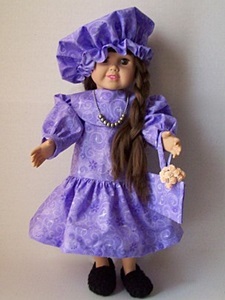 Jewelry, baby doll clothes, and other items you will love to buy. I have known Dora for some years now, and I can be honest and say with sincerity that she is as wonderful to know as a friend and even more so as a Small Business Owner. Dora and is always ready to answer any questions you may have about her handmade products and special orders. I recommend you put Calcedonia Design on your shopping list and take a look at the quality of work and design. When buying for yourself, a family, friend or for a new baby gift, think Calcedonia Design for that special someone. Thank you Calcedonia Ladies, for all the beauty you bring to the world. Support your local online Sellers and buy USA handmade products. Look for our next Small Business Showcase coming soon. If you are just a computer user, you may not know that you have the women of invention to thank for the tool you are using today. Incredible, you say… and yes, it’s totally incredible! Not everyone will agree with me, but here’s the facts. Women, you have no doubt heard of in passing, have played a huge part that pioneered the way to the technology we have today, in so many ways. Let’s take some examples. I just choose a few that stood out among the many. Hedy Lamarr was a movie star in the MGM days, yet a brilliant mathematician. She co-invented a technique for technology hopping that currently serves as the basis for Bluetooth and WiFi. Incredible! Ada Lovelace was a mathematician in the 1840’s who is credited in writing the first computer program, decades before the computer was invented. Incredible! Alexander Graham Bell, may have been the inventor of the telephone and a single line, but Dr. Ema Hoover, who is also a mathematician, she invented the computerized telephone switching methods and revolutionized the modern communication. As you use your modern computer today and talk on a phone with multi-functions and ability to switch calls… I’d like you to remember that women, have played such a big roll in our history of technology, but we still have to work harder and work longer for the recognition. As a business woman, thankfully, I have many mentors to look up to. I know that my hard work and efforts to help other women in business is a gift. I may not be a famous person for doing what i do, but hopefully I’ll be remembered in kind. Thank a woman in business today.